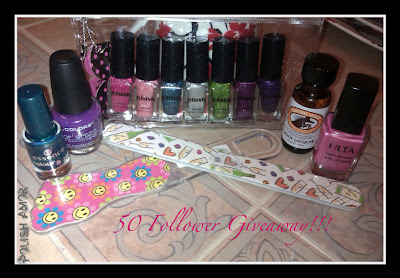 Polish Amor ♥: 50+ Follower Giveway!!!! First I want to deeply thank every single one of you who is following my blog!!! I reached 50 Followers over the weekend...I was super excited when I saw that...It has been fun reading other blogs.... & learning new things from you guys!!! All in all, it has been a great experience so far. Giveaway ends on July 31st at 11:59 pm, central time and is open internationally. New Followers are always Welcome to participate. ***All prizes were bought by me! CONTEST IS CLOSED, WINNER WILL BE ANNOUNCED SHORTLY!!!!!!! Congrats on your first 50 followers and good luck to everyone. Esos 50 serán los primeros de muchos más. hey, thanks for the lovely giveaway! thanks for this GA i want to participate!